When you’re hunting in group, communication is extremely important aspect to keep it in mind and make preparations it ahead of time with the right gadgets. Two ways radios are vital communication tools in finding success and keeping you and your hunting buddy’s safe, these hunting radios most often have up to 30-50 miles in range. There are wide range of two way radios available in the market but you need to purchase the hunting radio meticulously. For hunting, you might want to select kind of radios that delivers you connectivity in mountains and in the woods. So you need to carefully review and see the features that are required in a hunting radio. These portable two way radios gives a good range of 20 to 50 miles but only when its clear line of sight, in the forest and mountains these radios perform badly. You need to keep few things in mind before choosing radio for hunting, it ought to be powerful enough to communicate through obstructions, it must have a good battery life, it should have a feature of weather information and it needs to be weatherproof. Keep this thing in mind before purchasing a radio for hunting and you won’t disappoint.In this article,we compiles list of top five hunting radios to help you buy right two way radio. 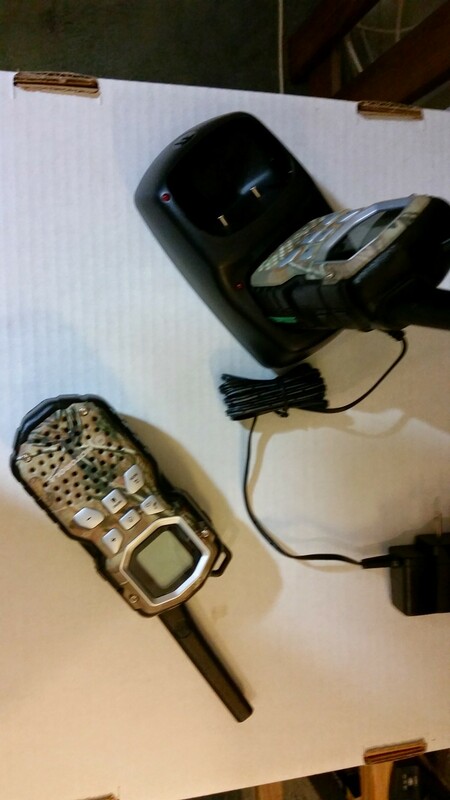 1.Motorola MS355R FRS Waterproof Two-Way 35 Mile Radio pack. 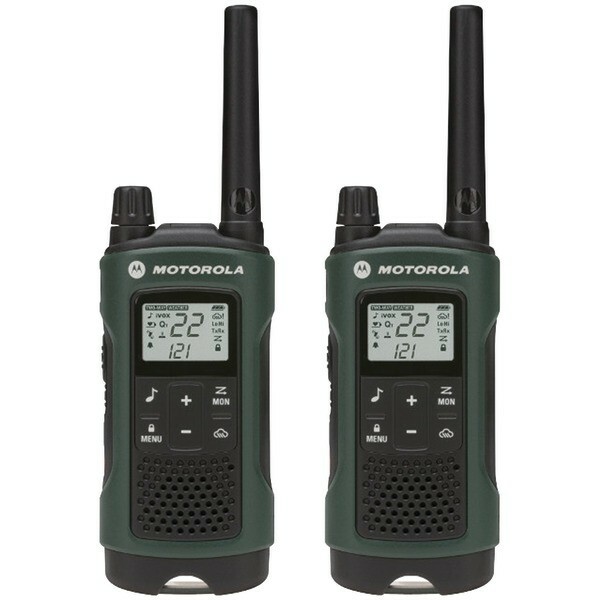 With Motorola MS355R radios, you get an incredible 35-mile range which is suitable for hunting on large area. It has a battery life of 9 hours and additionally they support AAA batteries so that you can easily replace while you’re still out there hunting when the built in NiMH ran out of juice. It supports NOAA weather alerts as well.Camo pattern helps you to blend in with envirnment.Not only is this MS355R model is waterproof, but it really floats if you drop it in the water! Apparently, it can last up to 1.5 minutes being submerged in water and still work with out any issues! That’s pretty cool. With a range of up to 35 miles and freedom to communicate wirelessly, the MT350R is perfect radio for your next hunting or hiking excursions. MT350R is water proof and comes with IP54 rating which protect the radio from dust and damp and comes in handy to use in rainy conditions. MT Series Radio delivers clear sounds quality by eliminating distortion at high volumes with the help of built in high efficiency class D amplifier. It offers hands free communication support using iVOX feature which allows to use the two way radio like a speaker phone when you are climbing or doing some other chores. Built-in VibraCall™ silent vibrating ringer feature is very useful when you are hunting or hiking and helps you to avoid intrusive ringing. It has friendly mini-usb charger for easy charging and if you ran out of charge, you can drop in AAA batteries and you are good to go. 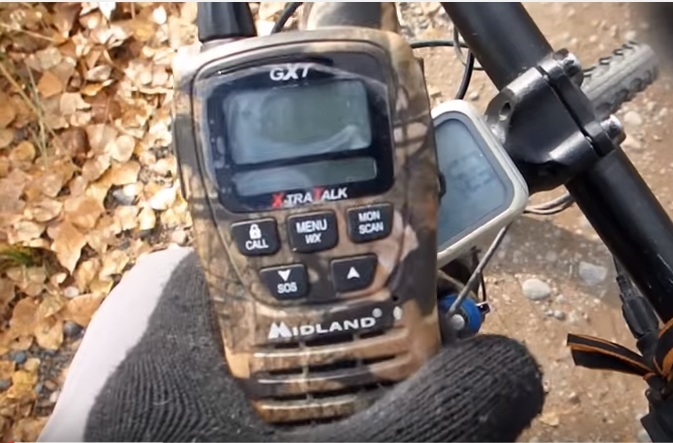 We have tested the GXT 2050 Midland Radios with 15 degrees outside temperature with over cast skies and tested with 5 miles range and over all we got a good reception. The reception is crystal clear both ways. I has the headsets included and perfect for hunting and hiking since you do not need to buy additional headsets. JIS4 Waterproof** – Protection in all directions against light rain or splashing water. NOAA Weather Alert Radio with Weather Scan which automatically locks onto your local weather channel and alerts you to severe weather. Whisper Mode – Allows you to speak quietly and still be heard by others especially useful in hunting. Midland GXT1050VP4 is a great quality two radio specially designed by midland for hunters. It has all three necessary features and other than this it has a SOS siren for emergency situation, you can send position locator signal with this feature. Midland 1050Vp4 widely popular radio among hunters. The Motorola Talkabout T465 is with amazing features and comes with PTT microphone.It is designed particularly for hunters. The T465 Two Way radios’s are waterproof, immune to rain, snow and various climate conditions. There are actually 22 channels, using privacy codes, you will find over 1662 combinations of channel configurations. The NOAA channel keeps you updated with real time weather conditions, even though this service may not be available in all areas. The included batteries are rechargeable, and you can substitute AA batteries when you are out of built in battery juice. There is also the ability to communicate hands free and utilize the Vibracall for situations that demand tranquil environment, such as when you are hunting. You could also customize your ringtones with 20 different call tones, including animal calls. T465 Radio pack comes with pair of radios in an outdoor green color, 2 NiMH rechargeable batteries, 2 Micro-USB wall charging cables,2 belt clips, 2 earbuds with PTT microphone all in a nice black carrying case. Check out the above selection of radios before you head out to hunting or fishing in a group and two way radios are not only the communication tools but keeps you safe too.Please make sure that you follow local laws and regulations when using two way radios for hunting.